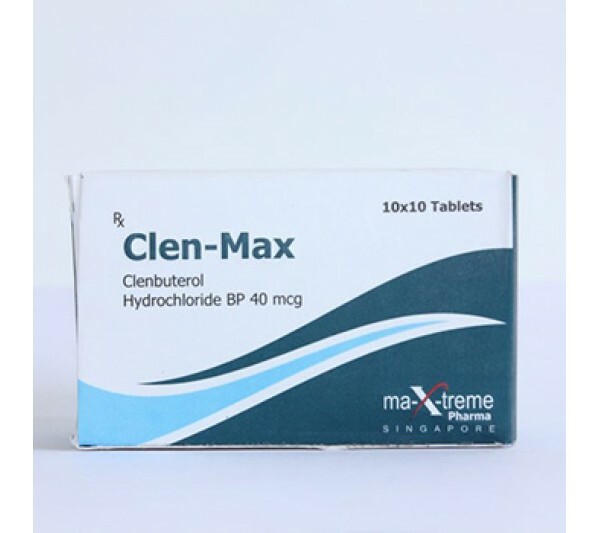 Clen-Max is a drug used in the treatment of bronchial asthma. But over the past few years, his popularity has increased dramatically among athletes (in fitness and bodybuilding). This happened due to the ability of the drug to burn fat. Athletes also use thyroxin and ketotifen (which further accelerates the process of burning fat) while taking clenbuterol. Clen-Max is not an anabolic steroid, but belongs to the group of adrenergic mimetics. To buy Clen-Max, you need a doctor's prescription. Clen-Max acts on the nervous system in such a way that the body begins to actively release norepinephrine and adrenaline. Their powerful fat burning effect and appreciated by athletes. Moreover, the drug can increase the level of exchange by 20, and sometimes even 30%. Clen-Max has an effect on the thyroid gland, accelerating the secretion of hormones, which, in turn, are natural fat burners in the body. Also, the drug does not give lipoprotein lipase active, and as a result, the accumulation of fat deposits becomes impossible. Another feature of clenbuterol is that it protects the muscles from damage, which is very important when the athlete loses weight or dries. So it turns out that the medicine is characterized by a pronounced anabolic effect, which has been repeatedly proved during experiments (in animals), as well as by practical use in bodybuilding. Another important detail that is important to remember: clenbuterol makes breathing easier and has fewer side effects on the cardiovascular system, compared with the same ephedrine. It is worth noting that with proper use - that is, in combination with diet and in the right dosages - this tool has almost no side effects. Shivering - expressed on the first day of admission, but does not bother (or eliminated by ketotifen). Anxiety increased - occurs only in 6% of people and is eliminated by ketotifen. Insomnia is rarely eliminated with ketotifen. Arrhythmia is rare, and is eliminated by the additional intake of beta-1-blocker. Increased blood pressure - worried about 6 out of 100 people, and is eliminated by beta-1-blockers. Diarrhea is possible only in the first days of admission. Nausea occurs very rarely and, as a rule, passes itself. Seizures (occur only with excessive admission - or the beginning of admission). Most of the side effects either go away on their own or can be eliminated by taking other types of sports nutrition. In combination, this approach gives an almost complete absence of side effects, which is extremely rare for fat burners.